Henley won a gift certificate from Bluewater Travel! The story: Yellowhead Jawfish incubating eggs in his mouth. With jawfish, and as often happens in the marine world, the responsibility for carrying the eggs falls to the father. 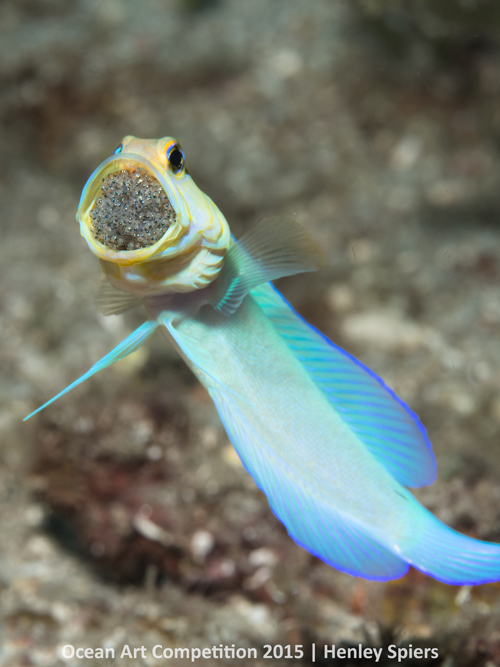 Once gathered from the female, the male jawfish will hold the eggs in it’s mouth for 7 - 10 days. During this time he will forsake his own sustenance for the sake of his offspring. He will also occasionally rotate the eggs by spitting them out and shuffling them. This action keeps the eggs well aerated and takes place in about half a second. Having spotted a Yellowhead with eggs whilst teaching a diving course the previous day, I resolved to return and try to get a shot of this incredible behaviour. They are notoriously skittish and will dart back into their burrow at the first sign of a possible threat. Once I identified the pregnant male, I very slowly crept up closer to the jawfish. The first few times he quickly disappeared and I had to retreat. After a few approaches he started to become more habituated to my presence and I was now able to get close enough to shoot one frame before he disappeared again. I was also trying to breathe out as gently as possible as the noise and bubbles would alarm him. My dive time was coming to an end and I resolved to make one last approach. This time, as I crept into position, the Jawfish rotated the eggs in a split second and I was able to capture the moment as he opened wide to momentarily spit them all out!